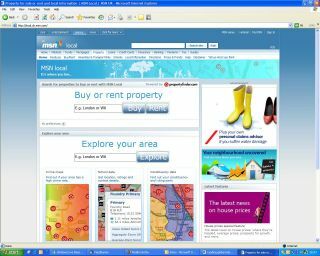 MSN UK launches a new property information service tailored for British house-hunters, offering localised property data for those looking to rent or buy a new place. Microsoft claims that ther new service offers "a market-leading range of data to allow people to conduct personalised searches of any UK neighbourhood and create an-easy-to-understand map, with all relevant information displayed succinctly on one page." The service has been launched in association with the leading property portal Propertyfinder.com and Virtual Earth developers Shoothill, with the aim of giving users "informed property choices and get the most out of their property and neighbourhood" – so you can get all the latest data on a locality's crime statistics, schools, local flood maps, constituency information, amenities, transport, demographic information and so on. Microsoft adds that "properties for sale will be collated at the click of a button depending on consumer's requirements" and that "the site will also allow potential landlords to assess the commercial viability of a neighbourhood by gauging expected rental yield." "We wanted to provide people with the tools for them to make informed decisions for their specific requirements," says Alastair Bruce, Senior Content Manager from MSN Local . "On MSN Local it is possible to search for a property for sale that's close to a good school, public transport, and amenities, that's not in a high crime risk area, and that's in an area where property is good value. The information is then clearly displayed on a map, and can be easily shared with friends and family, all in easy to use manner. You can save your searches and get alerts as well."